Dessert Darling Thinny Thursday, the Skinny on Raw Desserts | Dessert Darling recently asked me what Raw Desserts are, so I’m taking this Thinny Thursday to explain. Raw Desserts are basically a God-send if you’re abstaining from refined foods, white sugar, flour, are Vegan, Gluten-free, and like sweets! According to About.com, a raw food diet consists of “raw, vegan foods that have not been heated above 115 degrees Fahrenheit” so as to not lose their enzymes and nutritional value. These desserts are sweetened with natural and unrefined ingredients like dates, agave nectar, coconut and fruit. Additionally, they use crushed or pureed nuts to make the base of these treats. While Raw Desserts can be high in nut fat, every ingredient is usually a healthful item with minerals, vitamins, protein, and fiber. You can usually find Raw Desserts in a refrigerated area of a health food store like Whole Foods. 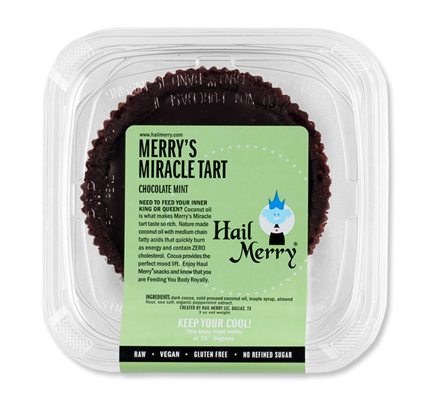 Below is an image of one of my favorite Raw Chocolate Treats by Hail Merry (see review here). Yum! I loooove hail merry desserts! And you have to try the raw chocolate chip cookie dough cheesecake from Sun Cafe, it’s to die for!